Louisianians take pride in the appearance of their landscapes, and weeds detract from this beauty. Along with being aesthetically displeasing, weeds in flower beds compete with desirable plants for water, nutrients and light and soon can get out of control. Most people rely on back-breaking hand removal to remove weed problems. Hand pulling may be successful for a few weeds, but for most it is only partially effective. Weeds have defense mechanisms that reduce the effectiveness of hand pulling. Annual weeds often break at the stem when pulled, leaving the root or single stem available for potential reestablishment. However, for perennial weeds like purple nutsedge and bermudagrass hand removal is nearly impossible. Perennial weeds have underground structures that are left in the soil after hand removal. In reality, hand pulling weeds is one of several practices that should be used together for optimum weed control in flowerbeds. These additional practices include the use of mulch, preemergence herbicides and, to a limited extent, postemergence herbicides. Mulch is an extremely important tool for weed management in landscape beds. Mulch acts as a physical barrier to the emerging seedling, and it prevents sunlight from reaching the soil surface. Blocking sunlight is important because some weed seeds such as crabgrass will not germinate without stimulation from sunlight. Also, sunlight is critical for the new weed seedling to begin photosynthesis for growth and development. Several materials are suitable for mulch including, compost, leaf litter, pine bark, pine mulch and pine straw. Even newspapers can be used as a barrier to weed emergence. Mulches must be thick enough to block light to be effective. As a rule, mulch trees to a depth of 3-4 inches and shrubs to a depth of 2-3 inches. Though mulch is beneficial, it will not hold back most weed infestations. It is important to use mulch in conjunction with preemergence herbicides. Using herbicides for flowerbed weed control can be difficult because of the wide array of high-value ornamental plants grown and their varying tolerances to herbicides. When it comes to herbicide use in flowerbeds, ornamentals are most tolerant of preemergence herbicides. Preemergence herbicides are weed preventers that are used in most every row crop to supplement a bevy of postemergence herbicide choices. However, these types of herbicides are almost exclusively relied upon for flowerbed weed management and are the backbone of chemical weed control in landscape beds. Preemergence herbicides work by forming a barrier in the upper ½ to 1 inch of the mulch or soil where most seeds germinate and kill weeds as they attempt to emerge. Because these herbicides have no effect on existing weeds, timing the preemergence herbicide application properly is critical for success. Preemergence herbicides work prior to weed emergence, so applications must occur before weed germination. Any existing weeds should be hand removed or carefully spot-treated with a nonselective herbicide prior to treatment. Add water after applying the herbicide. In most cases preemergence herbicides should be applied every 2½ to 3 months. Consult product labels concerning tolerances by desirable plants. Preemergence herbicides can be effective on several annual weeds including crabgrass, goosegrass, spurges, common purslane and mulberry weed. Most perennial weeds such as purple nutsedge and Florida betony are not controlled with preemergence herbicides. It is important to control weeds with mulch and preemergence herbicides because once they have emerged your options become more limited. Few selective postemergence herbicides are available, especially for broadleaf weeds. There is good news when it comes to selectively controlling most summer grasses like crabgrass and bermudagrass and sedges like purple and yellow nutsedge. Most summer grasses are controlled with herbicides containing the active ingredients fluazifop or sethoxydim. Sedges can be controlled by directed sprays of halosulfuron (Sedgehammer) or sulfosulfuron (Certainty). Additionally, glyphosate can be carefully spot-treated or applied as a wipe for hard-to-control weeds. Spurge – Several types of spurges are common in landscape beds. Members of the Euphorbaceae (poinsettia) family, spurges are prolific seed-producing annuals that thrive in hot weather. Under optimum growing conditions, plants can go from seed to flower in only three weeks. Some spurges have a more prostrate growth habit that can form dense mats, whereas many spurge species grow more upright. Spurges emit milky latex from broken stems that can be helpful in distinguishing this plant from other species. The plants are difficult to manage in flowerbeds due to heavy seed production and the inability to be successfully removed by hand. Plants often break at the stem during this process, leaving the root and several buds or a single stem available for potential reestablishment. Control: Most preemergence herbicides work well on spurge. However, the problem usually is in the frequency of the application because spurge control starts failing four to six weeks after application. Professional herbicides that work well include Free Hand (dimethenamid + pendimethalin), Pendulum/PreM and other trade names (pendimethalin), Barricade and Regalkade (prodiamine), Surflan (oryzalin) and Snapshot (isoxaben + trifluralin). Consumer herbicide options include Preen (dithiopyr or trifluralin) and Hi-Yield Weed Stopper with Dimension (dithiopyr). Chamberbitter (Phyllanthus urinaria) – A member of the Euphorbiaceae family, chamberbitter is an extremely invasive summer annual. 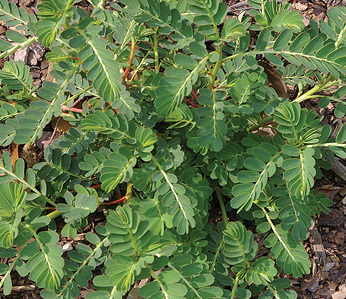 Chamberbitter resembles hemp sesbania or mimosa seedlings. However, the most distinguishing characteristic is the round seed capsules located on the underside of slender branches. 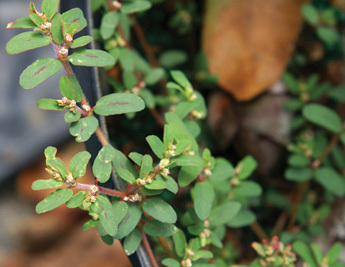 Chamberbitter needs temperatures consistently above 75 degrees; therefore, these plants tend to germinate a little later in the spring than many other flowerbed weeds. Populations of chamberbitter have increased significantly since their introduction from Asia because of their prolific seed production and tolerance of most preemergence herbicides labeled for use in ornamental nurseries. Control: Light may be necessary to stimulate chamberbitter germination, so thick mulch is helpful in reducing plant populations. Chamberbitter hand pulls very easily, but frequent germination and high populations make hand removal only partially effective. Preemergence herbicides have performed erratically, so using hand removal and mulch in conjunction with herbicides are important to optimize chamberbitter control. Professional herbicides that have activity on chamberbitter include Rout (oxyfluorfen + oryzalin), OH2 (oxyfluorfen + pendimethalin), and other oxyfluorfen containing herbicides. Sureguard and Broadstar (flumioxazin) are effective herbicides as well. Most consumer herbicides are weak on chamberbitter. Common bermudagrass – Common bermudagrass is the most widespread grass problem infesting flowerbeds. It is a perennial, warm-season grass originating in Africa that grows well in our Louisiana climate. The grass is widely used for lawns, athletic fields and golf courses, but it is invasive in flowerbeds. Common bermudagrass is characterized by its dark green color, fine texture and the production of rhizomes (below-ground stems) and stolons (above-ground stems) that allow the plant to establish quickly in the landscape. Control: Because of its complex stolon and rhizome system, hand removal is not effective for controlling common bermudagrass infestations in landscape beds. Because the weed mainly reproduces vegetatively and creeps into flowerbeds, preemergence herbicides have no effect on the weed either. Frequent applications of grass-killing herbicides like Fusilade and Segment can be effective in managing bermudagrass in landscape beds. These types of herbicides only work on grasses and are usually safe over the top of most nongrass landscape plants such as bedding plants, perennial ground covers and shrubs. Consumer versions of these herbicides include Ortho GrassBGon (fluazifop) and Fertilome Over the Top II (sethoxydim). Nutsedges – Purple nutsedge ranks as the No. 1 weed problem in the world and is the most common weed infesting residential and commercial landscape plantings. Yellow nutsedge prefers moist environments and is more common in irrigated beds or during wet growing seasons. Both are grass-like plants with an extensive system of tubers that allow the plants to reproduce rapidly in landscape beds. Control: Nutsedges are difficult to manage consistently in landscape beds. 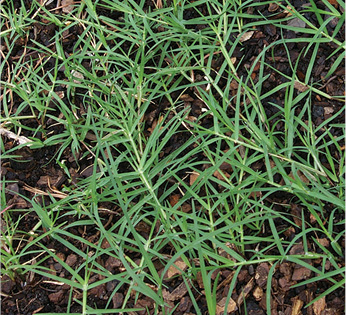 Neither purple nor yellow nutsedge can be controlled by hand removal, and mulches are only slightly effective. Yellow nutsedge can be partially managed with preemergence herbicides with the active ingredients metolachlor (Pennant Magnum) or dimethenamid (Tower and Free Hand). Unfortunately, there are no good preemergence options for purple nutsedge. Postemergence herbicides Sedgehammer (halosulfuron) and Certainty (sulfosulfuron) are two effective herbicides registered for the selective removal of sedges in landscape beds. In most situations, these herbicides should be applied as directed sprays. Consult product labels for lists of tolerant plants and application techniques. For most situations, the best defense against weed infestations in the flowerbed is reliance on mulch, periodic hand pulling and an aggressive preemergence herbicide program. Certain weeds prevalent in Louisiana landscapes are almost uncontrollable. These include torpedograss, bushkiller vine and cogongrass. Torpedograss – Torpedograss is a perennial, rhizomatous grass that is considered one of the most invasive grasses in the world. Although the plant does produce seed, the seeds are not viable. The weedy grass solely reproduces vegetatively by robust rhizomes. 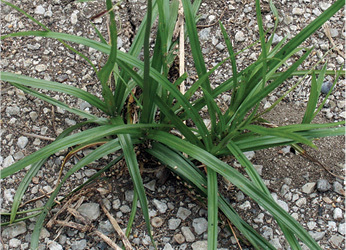 The spread of torpedograss in Louisiana is mainly attributed to the movement of soils infested with torpedograss from the Bonnet Carré Spillway. The spillway is just west of New Orleans and is the main source of torpedograss for southeast Louisiana, especially within the New Orleans metro area. For years, there were no reports of infestations in north Louisiana; however, torpedograss infestations have been confirmed at several locations in northern areas of the state. Control: Complete control of torpedograss may not be possible. Grass-killing herbicides normally prescribed for flowerbeds like sethoxydim and fluazifop are just not very effective on torpedograss, although fluazifop is a little better than sethoxydim. Glyphosate is the best herbicide on the weed, but high rates are necessary for control. Directed sprays of glyphosate are not always safe in landscape plantings due to the potential for drift. It may be safer to wipe the weed with a glyphosate/water solution that is at least 10 percent glyphosate when it is in a landscape bed. Using a chemical-resistant glove inside a cotton glove to wipe the solution on the torpedograss foliage is an effective method of application. Repeated applications are always necessary for torpedograss. 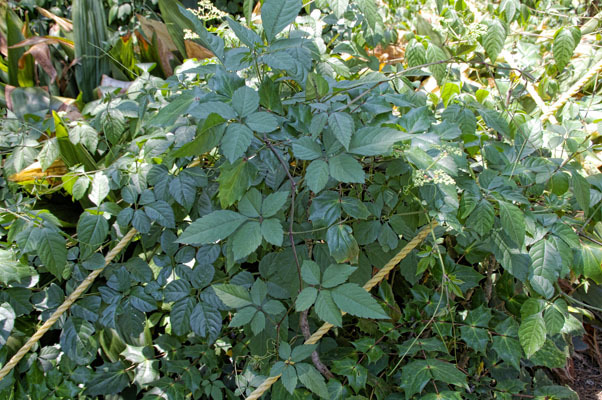 Bushkiller vine – This perennial herbaceous vine has compound leaves containing five leaflets. It produces salmon colored flowers eventually producing fruit with two to four seeds. Thankfully, the seed are not thought to be viable. The plant solely reproduces vegetatively. Native to Asia, bushkiller gets its name because the vine climbs over desirable plants and kills other plants by blocking out sunlight. 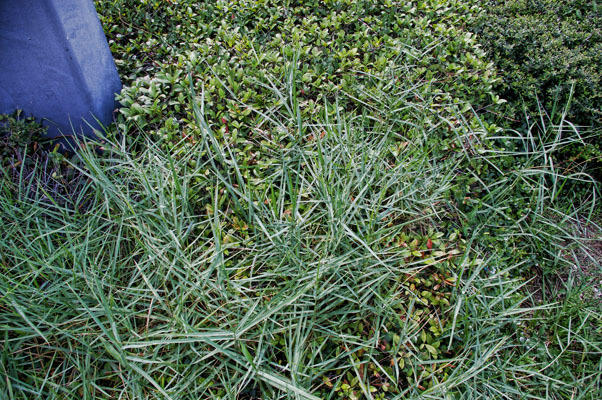 Few weeds take over areas as fast as bushkiller vine, and it rapidly overtakes landscape shrubs and groundcovers. Control: Bushkiller vine can be suppressed with repeated applications of two herbicides, glyphosate and triclopyr, applied as directed sprays. Unfortunately, the vine intertwines in the landscape, making herbicide applications very difficult. Often it is necessary to treat fresh-cut plants or wipe the weed directly when spraying is too risky in the landscape. Don’t expect to get rid of it with one application. Be sure to treat properties nearby because the weed will rapidly re-infest treated areas. Cogongrass – Cogongrass has been causing problems in the southeastern areas of the United States for several years. Thousands of acres are covered with the perennial grass, and millions of dollars have been spent to control this invasive weed. In Louisiana, St. Tammany Parish has the highest population of cogongrass, another 10 parishes may have some degree of infestation. Cogongrass is native to Southeast Asia and spreads by both wind-blown seeds and underground, creeping rhizomes. The plant produces fluffy, white, plume-like seed heads in early spring. Cogongrass makes about 3,000 seeds per plant, but the seeds need to land on bare soil to get the weed established. The main way the plant gets established is by rhizomes either transported on tillage equipment, through contaminated soil or by creeping into new areas. Rhizomes may make up 80 percent of the plant mass, which allows the plant to recover from most mowing and herbicide applications. Once the cogongrass is established, the area becomes a monoculture of cogongrass with nothing else able to grow. Control: Cogongrass control is a long-term endeavor that requires the repeated use of glyphosate and imazapyr (Arsenal). Areas treated must be taken out of use potentially for years. This weed problem requires landscapers no option but to declare an all-out war to reclaim the land. Ron Strahan, Associate Professor, School of Plant, Environmental & Soil Sciences, LSU AgCenter, Baton Rouge, La.